Microsoft Edge is the new browser first released with Windows 10, that is intended to replace the ageing and somewhat creaky Internet Explorer. According to Microsoft claims Edge is designed to be lightweight, with a new rendering engine that is built around web standards giving a much improved web viewing experience than previously seen in Internet Explorer.Microsoft Edge is included as the default browser in all installations of Windows 10, as well as Windows 10 mobile, and Xbox One. Whilst Edge supports an integrated Adobe Flash player, and a PDF reader it doesn’t at the time of writing support legacy technologies such as ActiveX, Browser Helper Objects, and other extensions. It is widely expected that the ‘Anniversary Update’ to Windows 10 due at the end of July 2016 will provide extension support as standard. Edge is also integrated with Microsoft’s online services as well the Cortana digital assistant to provide voice control, search functionality, and personalised dynamic content related to searches within the address bar. OneDrive users can also make annotations to web pages that can be stored for later use or shared with others. Whilst Microsoft Edge is still very much a work in progress, refinements such as extension support and the increase in market share of Windows 10, will help Edge to overtake Internet Explorer in usage, and is likely to challenge both Chrome and FireFox for dominance of the Windows based browser wars. 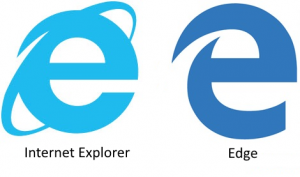 Microsoft decided to use a logo for Edge that was very close to the one used by Internet Explorer, many people believe that this is a deliberate ploy by Microsoft to dupe users in to thinking they are using a browser that they already know, however, there is a school of thought that says this may have backfired as many people wouldn’t use for exactly the same reason.